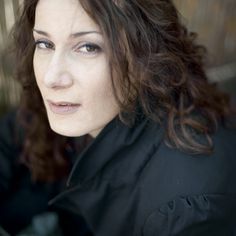 Born in Munich and trained in Vienna, Annette Schönmüller gained rapidly increasing attention for her impressive stage presence and vocal intensity and received rave reviews for her performances of music theater works from the late romantic and modern period as well as from the late 20th and 21st Century. In 2014/2015 season she had great success in the world premiere of Rolf Riehm's Sirenen, making her debut at the Oper Frankfurt, conducted by Martyn Brabbins and staged by Tobias Heyder. In Salvatore Sciarrinos "Infinito nero" conducted by Marino Formenti she is invited to the Biennale Salzburg and gives her debut at Staatstheater Darmstadt in a scenic production of Prometeo by Luigi Nono under the baton of Johannes Harneit, followed by concerts at the Ostrava New Music Festival/CZ, where she perfoms works by Wolfgang Rihm and Rolf Riehm (world premiere). 2016 she was highly successful at the opening of Münchener Biennale für zeitgenössisches Musiktheater 2016 as the female protagonist in the world premiere of David Fennessys musictheatre „The sweat of the sun“ (2017 at Operadagen Rotterdam and at Theater Osnabrück), and gave her debut at Brucknerhaus Linz with H.W. Henzes "El rey de Harlem" under the baton of Johannes Kalitzke at Festival Neue Musik and as Magdalena in Gottfried von Einems "Jesu Hochzeit" under the baton of Jonathan Stockhammer at the Festival Carinthischer Sommer (Carinthian Summer) . Recently she had big success at her debut at Opernhaus Zürich with G. Aperghis´ monodram " Dark Side" and in the main part of Die Frau in a np of Chaya Czernowin´s "Adama" at Theater Freiburg. Her plans include Therese Schurz in the world premiere of "Lunea" by Heinz Holliger at Opernhaus Zürich under the baton of the composer and directed by Andreas Homoki and her debut as Marta in a np of Mieczysław Weinberg´s "The Passenger". After having big success in the title part in Paradise reloaded (Lilith) by Peter Eötvös, who wrote the main part espacially for Annette Schönmüller, at the Festival WIEN MODERN 2013 (directed by Johannes Erath, conducted by Walter Kobéra), the production was also shown at the Palace of Arts in Budapest and recorded for CD (BMC records / Hungarian RSO under the baton of GMD Gergely Vajda). At the Wiener Festwochen 2013 she sang in the world premiere of Franz Koglmann‘s media opera "JOIN!" (a netzzeit co-production). Appearances in the 2012/2013 season include Peter Eötvös’ opera Harakiri and Radames at the Konzerthaus am Gendarmenmarkt in Berlin, the title role in Peter Maxwell Davies Miss Donnithorne's Maggot at the Wiener Kammeroper and G. Ligeti’s Le Grand Macabre (Mescalina) at the Neue Oper Wien/Museumsquartier Wien. In March 2012, the mezzo-soprano made her debut at the Amsterdam Concertgebouw as Malik in Henze's L'Upupa, under the baton of Markus Stenz. In April 2011 Annette Schönmüller made a very successful debut at the Theater an der Wien in Peter Maxwell Davies´ Monooper for solo mezzo Das Medium, (Director: Peter Pawlik): " highest vocal and dramatic intensity " (Wiener Zeitung). In the 2010/2011 season she was highly praised by audience and press as „Geesche Gottfried“ in Hölszky’s Bremer Freiheit at the Berlin Konzerthaus: "impressive" (Berliner Zeitung), " irresistible” (..) probably the best opera production of the season (...) great contemporary musical theater." (Berliner Morgenpost) - "One of the best performances of recent times." (Orpheus). Further performances in 2011 include a lecture recital with Aribert Reimann at the Curt-Sachs-Saal of the Berlin Philharmonie, on request of the composer as well as the premiere of Richard Dünser’s orchestral arrangement of Schönberg „Das Buch der hängenden Gärten“ at the Philharmonie in Graz.